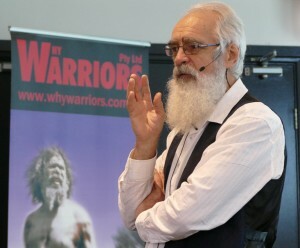 Why Warriors possesses a unique body of knowledge and experience developed over 40 years of working on the ground in remote Aboriginal communities. We have been delivering positive, practical and effective cross-cultural training for over 30 years. 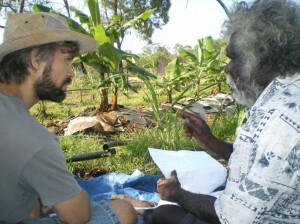 Through our training, staff will learn about cultural relationships and also how to look after themselves. This will lead to improved client relations and better service delivery with greater cultural safety in the workplace, reduced personal burnout, decreased staff conflict and a slashing of staff recruitment costs. We can deliver different levels of training depending on your requirements. Many organisations could do little more than simply get their staff to read the book “Why Warriors Lie Down & Die”. 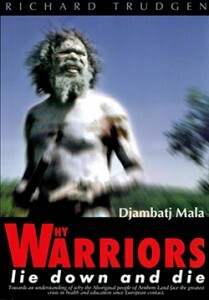 With over 50,000 copies now in circulation around Australia and across the world, many people from a wide cross-section have attested to the book’s incredible ability to take the reader on a mind-opening journey to the other side of the cultural divide. Richard Trudgen’s seminal work provides positive information and knowledge to equip readers to be more aware, informed and skilled when they enter any cross-cultural environment. Try it, you will soon be buying every staff member one. Cross-Cultural, Cultural-Awareness, Cross-Cultural Communication, Cultural Competency, Community Development, Community Education and Working Safely in a Cross-Culture Environment workshops or a mix of all the above. With over 40 years of training experience, Richard Trudgen now offers you training workshops specially tailored to meet your unique workplace and organisational needs. Richard will listen to your needs and then build an appropriate workshop for your group or organisation. Workshops can range from a half-day introduction to a number of days. These workshops will equip staff with essential awareness, information and skills to better navigate any complex cultural interface with all its unknown surprises. Previous training clients include Rio Tinto, Australian Charities and Not-For-Profits Commission (ACNC), NSW Environmental Protection Authority (NSW EPA), SA Fire and Emergency Services, Anglicare, MacDonnell Shire Council, and many others. To enquire about a cultural awareness course, please contact us. This training is for professional staff who work at the active interface with Aboriginal people, in what we call the inter-cultural ‘Grey Zone’. Whilst Human Resources and Safety Officers will be able to advise on most potentially “hazardous zones”, the Grey Zone is little understood or even recognised. Special mindfulness, knowledge and skills are needed to enter this “Grey Zone” and return from it without damage being done. If people are not mindful of the fact that they are entering the Zone, have little knowledge about it, and do not possess the skills to operate in it, then the chances are they will leave the Zone having damaged themselves or having done harm to others. Frontline staff need to reach a higher level of cross-cultural competency where the ability to resolve conflicts is paramount. However, it is also important for those in HR and relevant management areas to undertake this training, so that they are able to incorporate knowledge of the Grey Zone into their decision-making and staff relations. To enquire about cross-cultural training for frontline staff, please contact us. Many organisations will face ongoing challenges and unforeseen situations in the cross-cultural sphere. In order to be of assistance in the long term, Why Warriors offers a regular mentoring and troubleshooting service to provide that instant help in times of need. This can range from scheduled face-to-face sessions to phone and email support, scaled according to the organisation’s needs. To find out more about our mentoring packages, please contact us.